Reading and share top 6 famous quotes and sayings about Flora And Fauna by famous authors and people. Browse top 6 famous quotes and sayings about Flora And Fauna by most favorite authors. 1. "I had no lock that could be picked. If anything, I was the landscape behind the door, and even on that day in the ruin, I was still only beginning to comprehend my own flora and fauna." 2. 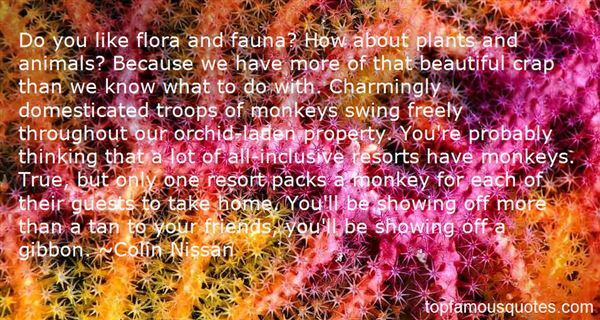 "Do you like flora and fauna? How about plants and animals? Because we have more of that beautiful crap than we know what to do with. Charmingly domesticated troops of monkeys swing freely throughout our orchid-laden property. You're probably thinking that a lot of all-inclusive resorts have monkeys. True, but only one resort packs a monkey for each of their guests to take home. You'll be showing off more than a tan to your friends, you'll be showing off a gibbon." 3. "Mr. Kadam asked me many questions about Oregon. 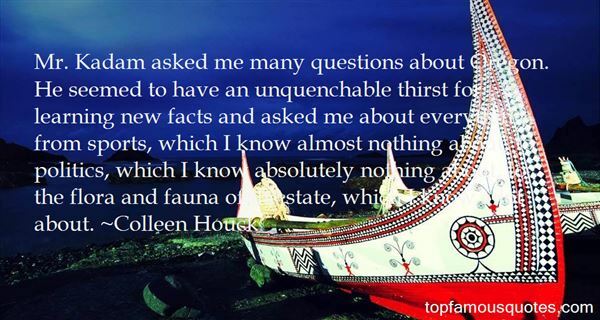 He seemed to have an unquenchable thirst for learning new facts and asked me about everything from sports, which I know almost nothing about, to politics, which I know absolutely nothing about, to the flora and fauna of the state, which I know a lot about." 4. "There is at the back of every artist's mind something like a pattern and a type of architecture. The original quality in any man of imagination is imagery. It is a thing like the landscape of his dreams; the sort of world he would like to make or in which he would like to wander, the strange flora and fauna, his own secret planet, the sort of thing he likes to think about. This general atmosphere, and pattern or a structure of growth, governs all his creations, however varied." 5. "To Nature nothing can be added; from Nature nothing can be taken away; the sum of her energies is constant, and the utmost man can do in the pursuit of physical truth, or in the applications of physical knowledge, is to shift the constituents of the never-varying total. The law of conservation rigidly excludes both creation and annihilation. Waves may change to ripples, and ripples to waves; magnitude may be substituted for number, and number for magnitude; asteroids may aggregate to suns, suns may resolve themselves into florae and faunae, and floras and faunas melt in air: the flux of power is eternally the same. 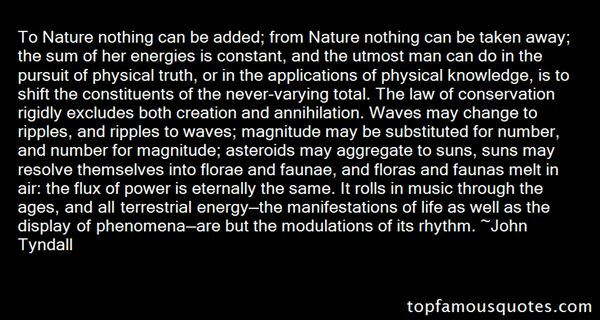 It rolls in music through the ages, and all terrestrial energy—the manifestations of life as well as the display of phenomena—are but the modulations of its rhythm." 6. "Sadly, I hate foreigners. And Americans. And animals. And flora, and some fauna. Also the magma that is the very core of this our mother earth. I'm full o' hate!" He thought how sad it was to be an Animal who had never had a bunch of violets picked for him."